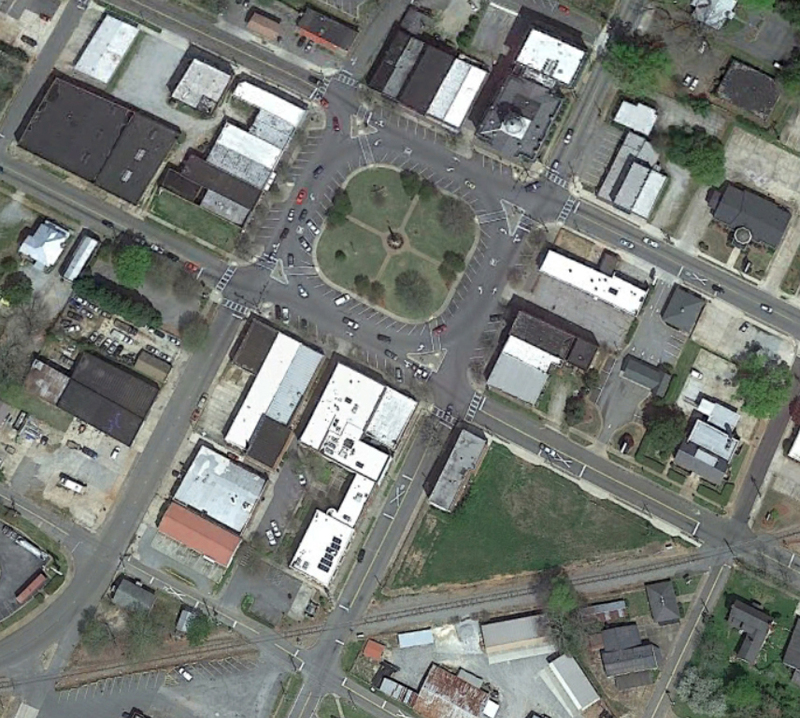 Google Earth view of downtown Monticello, Georgia. Benton Supply Company is at the southeast corner of the square. Built in 1902, the Benton Supply Company Building is one of the most significant of the 372 buildings designated as contributing structures in the Monticello, Georgia, National Register Historic District in 1997. Prominently located on the south side of the town square opposite the courthouse, the building’s Neoclassical Washington Street facade is second only to the courthouse in its architectural refinement and bold presence on the square. Two stories high and faced with buff-colored brick, the building’s main facade consists of five bays separated by brick pilasters capped with cast-iron Corinthian capitals. At the second floor, each bay is filled by a round-arch window opening with double-hung sash and transoms set in a Palladian motif. Pressed sheet-metal cornices, which have been sandblasted to remove paint and are deteriorating, mark the first and second floors of the building, with the frieze of the upper cornice impressed with large block letters denoting “Benton Supply Company Department Store.” At the first floor, the bays are separated by cast-iron columns, and the three bays to the east still retain their original 1902 plate glass windows and wooden bulkheads, which are badly deteriorated. Renovation of the western storefront in the 1960s, eliminated the street-level entrance to the second floor, which was a prominent feature in the historic building, and the bay is now filled with aluminum-framed, plate-glass door and windows. Figure 1. View of south side of courthouse square, showing Benton Supply Company, right, in 1906. Although conversion of the western side of the first floor into a grocery store has destroyed most of the historic interior features there, evidence of a one-story masonry building which predates the 1902 department store is evident in both the east and west walls of the old grocery store. Much of the upper floors of the building, however, remain essentially as they were built in 1902 with eight suites of offices separated by a central hall. One of the offices was converted to bathrooms at an early date and another was destroyed when the western side of the building was expanded during the 1910s. Other modifications to the offices, however, have left intact many original features, including plaster walls and ceilings, doors, baseboard, window and door trim, screen doors, mantles and fireplaces. The upper floors have deteriorated significantly due to leaking roofs and general neglect of the building. The main department store on the first floor was remodeled in the late 1930s but that did not obliterate all of the original interior finishes, including the beaded tongue-and-groove wood ceilings, the wood floors, the show window display cases, and even an early twentieth century toilet and remnants of the original lighting fixtures. In addition, most of the Modern design and features from the 1930s remodeling remain intact and are an important part of the building’s historic character. These later but still historically significant features include the display cases, dressing rooms, and the hand-painted Art Deco-inspired detail and lettering on the show windows, which are signed by Ben H. Orr of East Point, Georgia, one of the few craftsmen who have been identified for the building. The two-story brick building at 107 Funderburg was also built in 1902 as part of the original department story. The first floor of this building, which was expanded in the 1910s and connected with the rear basement of the main department store building by a freight elevator, housed the store’s farm department, selling equipment, seeds, and fertilizer. Originally, or at a very early date, the second floor of the 107 Funderburg building, which was near the same level as the first floor of the main building, was combined with the main department store into a single space and includes several significant features from both the 1902 building and from the 1930s remodeling. Two other buildings are included in the present city-owned complex and both contribute to the historic character of Monticello. The original 1902 stable at 106 Funderburg was demolished in the 1910s, but its one-story north wall remains incorporated into the south wall of the 107 Funderburg building. The larger stable that replaced the 1902 stable was recently demolished except for the red-brick street facade at 106 Funderburg. The cotton warehouse that was built on the interior of the block just before World War I was also demolished and only the foundations and part of the east wall remain standing. At 102-105 Funderburg is a two-story brick building that was built about 1910 for the Monticello Buggy Works, one of a number of small industries that were a prominent part of the local economy beginning early in the nineteenth century. This building is quite significant architecturally because its construction incorporated elements from the county’s antebellum courthouse, including three large stone columns at the first floor level and granite quoins at the corners of the red-brick facade. The stone string course, lintels and sills at the second floor may also be from the old courthouse, but the string course and lintel at the first floor level is cast concrete and probably dates to 1910. Although the four store-fronts at the first floor have been remodeled, all but one retains most of the original wooden bulkheads, windows and doors. The second floor of the building, which is where the buggies were assembled and painted, was serviced by a large freight elevator at the southwest corner of the building and it remains almost completely intact. The interior finishes at the second floor are also relatively unaltered but deteriorated. The large wooden columns that support the roof and divide the center of the room are not characteristic of early-twentieth century building and may also have been salvaged from the old courthouse. Although no archaeological investigation has been made for below-grade resources, historical research suggests the potential for below-grade archaeological resources. 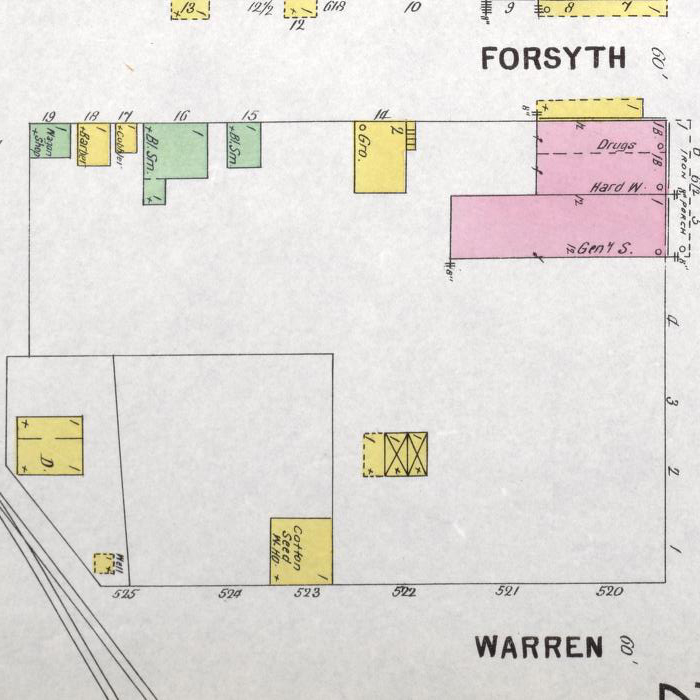 In particular, archaeological resources may be present that relate to the dwelling that faced South Street near the railroad and the well and well house that faced Warren Street at the railroad, both of which are shown on the 1898 Sanborn Fire Insurance map of the block (see Figure 2). The well could be a particularly important resource if it has not been disturbed. In addition, a well or other water-related feature may be located at the rear of the basement around the existing boiler room. A watertank is visible, apparently on the roof above this area, in one of the early photographs (see Figure 4) and this may have been the location for another well or cistern that served the buildings prior to the installation of municipal water after 1906. Privies may also have been located in the blind alley between the Buggy Works building and the surviving east wall of the cotton warehouse on the interior of the block and this alley may contain archaeological resources. Finally, a masonry blacksmith shop was located at the southwest corner of the Buggy Works building but was razed after World War II. Below-grade features of this structure may still be present on the site. In spite of almost total neglect in the last twenty-five years, most of the historically and architecturally significant features of the buildings remain intact. Most of the second floor offices and all of the second floor of the buggy works building remain essentially as they were built in 1902 and 1908, respectively. A few features of the Benton Supply Company store’s original interior remain visible, including the front display windows and the bead-board ceilings. Original plaster walls and wood floors are often in place beneath later coverings. Most of the elements from the interior remodeling that occurred in the late 1930s remain intact and are in good condition. Because of their age and because they represent a distinct period in commercial interior design and craftsmanship, these should be considered significant features of a building whose rich history on the square in Monticello has encompassed most of the twentieth century. The Benton Supply Company Building is located on the north half of what was Lot #6 of the original plan of the Town of Monticello. The lot’s original owner was John Cargile, one of the four “commis-sioners” who were appointed to locate and layout the county seat in 1807. Lying on the south side of the public square, the lot encompassed the north-west quadrant of the block bounded by Washington Avenue, Funderburg Drive (formerly Warren Street), Forsyth Street, and South Street. According to local tradition, Capt. Samuel Butts operated a store on the site of the Benton Supply Company building before his death at the Battle of Chalibbee in Alabama in 1814. Butts County was named in his honor in 1820. By 1829, there were nineteen stores in Monticello and, in 1840, the original log courthouse was replaced by a new brick courthouse. In 1843, the first of several major fires that would plague Monticello in the nineteenth century caused $50,000 in property damage to the business district. Before the Civil War, Francis M. Swanson and his partner Benjamin Catchings operated a store at the southwest corner of Washington Street and Funderburg Drive (then known as Warren Street). After the Civil War, they rented the property to William Mallory and, in October 1866, Swanson sold it to John R. Greene. Although the extent of this parcel of real estate was not defined in the deed, it appears to have included the site of the present building to the east of Benton Supply Co. as well as the alley and the Benton Supply Co. building at 107 Funderburg Drive. In 1874, fire destroyed the buildings on the north side of the square and resulted in renewed efforts to limit fire hazards. In 1876, a number of “fire alleys” were created, including the existing alley on the west side of the Benton Supply Company Building. In 1878, however, fire destroyed buildings on the east and southeast side of the square, including Kelsey’s building at 112 (old #5) Washington Avenue. In May 1878, Kelsey sold the property to James Watson for $200 and eventually moved to Atlanta. Figure 2. 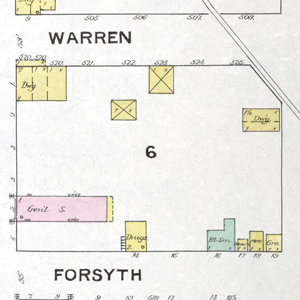 Detail from 1888 Sanborn Fire Insurance Map showing Block 6 of the original plan of Monticello, Georgia. Washington Street is at left along the north side of the block; South Street is at right along the rear of the block. In spite of efforts to control fires, three more disastrous fires swept the town between 1884 and 1887, the last of which left “only one side of the public square left standing with the exception of four buildings,” according to the local paper. Among the nine buildings destroyed in the January 1887 fire was the brick store that James Watson had built sometime after 1878 at 112 Washington. Although two buildings were quickly reconstructed at 115 and 116 (old # 9 and #11) at Washington, Watson did not rebuild his store. The shell of his one-story brick building at 112 Washington Avenue apparently remained standing and was incorporated into Benton Supply Company’s new building in 1902. In February 1880 Watson also bought a 16' x 72' parcel of land fronting Warren Street behind Greene’s store but his reason for the purchase is not known. 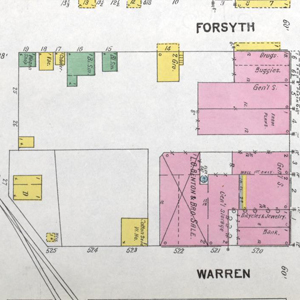 Watson may have operated a livery stable since two large stables are shown on the site in the 1893 Sanborn Fire Insurance Maps. y the time that the 1898 Sanborn Maps were made, these stables had been replaced by a smaller pair of stables. In 1898, the Bank of Jasper County constructed the brick building at 109 (old #1) Washington on the site of Swanson’s antebellum store. The remainder of the block fronting Washington between Forsyth and Warren apparently remained undeveloped. 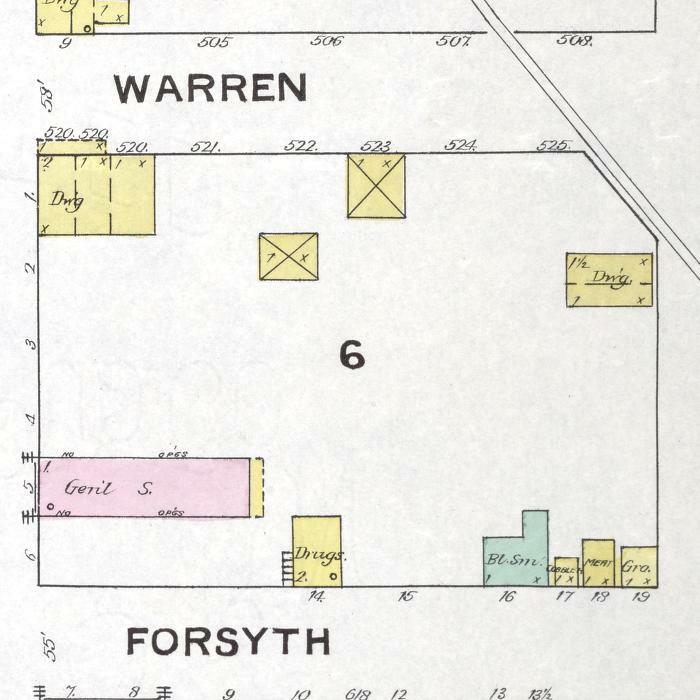 The southeast quadrant of the block bounded by Washington, Forsyth, Funderburg and South was designated Lot #17 in the town’s original 1807 plan, but the property was not heavily developed. By 1893, it contained a single, one-story, wood-framed dwelling facing South Street. By 1898, a small cotton-seed warehouse had been built at the northeast corner of the lot and a covered well was shown at the northwest corner of the intersection of Funderburg and the railroad. No other nineteenth century structures have been documented on Lot #17. Figure 3. 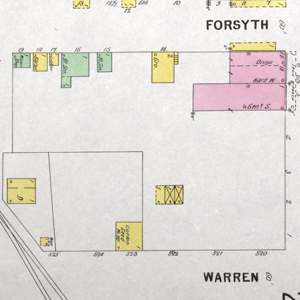 Detail from 1893 Sanborn map of Block 6 in Monticello. Compass directions are reversed in this image with Washington Street and north to the right. One of Jasper County’s earliest settlers was Abbe Benton (1788-1854), who emigrated to Jasper County shortly after his marriage to Martha Benton (no known relation) in Bentonville, NC, in 1815. They had at least three children, including sons John (1817-1893) and James (1821-1895), and they and their descendants played a major role in the historic development of Jasper County. James’ sons Milton S. Benton (1855-1917), Lurner Oliver “L. O.” Benton, Sr., (1862-1952) and Eugene Benton (1867-1930) and their brother-in-law John H. Kelly were prominent in a wide range of businesses in Monticello and Jasper County in the late nineteenth and early twentieth centuries. L.O. and his cousin Lucian Benton organized the Bank of Monticello, the county’s first bank, in 1892 and both L. O. and Eugene were prominent bankers in Georgia, Florida, and Alabama. 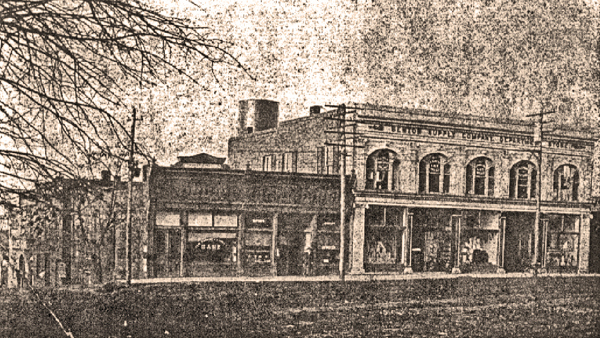 In 1902, the same year in which the Benton Supply Company Building was being built, L.O., his brother-in-law J.H. Kelly, his cousins Lucian and J.T. Benton, and others organized the Monticello Cotton Oil Company, which began operating in November 1902. In addition, L.O. and his cousin J. L. Benton were large peach-growers, a very valuable agricultural product in Jasper County during the late nineteenth and first half of the twentieth centuries. L.O. even developed a new variety of cling peach from seed he had obtained from South Africa and named the peach “Rosalind” after his daughter. In December 1886, Milton and L. O. Benton established a mercantile company under the name of L. O. Benton & Bro. that soon evolved into the Benton Supply Company. The business got off to inauspicious start, however, when the building that they rented was destroyed in the fire of January 1887. Located in the brick building that W. A. Kelly (brother of J. H. Kelly) had built at 115 (old #9) Washington Avenue the previous year, the store was soon rebuilt and, in 1890, the Bentons bought the building. Located opposite the Court House on the square, the enterprise was profitable, in spite of competition from several other local merchants, including their brother-in-law J. H. Kelly. With completion of the railroad to Monticello in 1887, merchandise no longer had to be carted from Forsyth or Madison, a much wider variety of goods became far easier to obtain, and the heyday of the small-town merchants began. Figure 4. Detail from 1898 Sanborn map showing Block 6. Washington Street and north are at right. By 1898, the Bentons had begun planning an expansion of their business and, in December, bought the “vacant store lot” next to the new Jasper County Bank building that was then being built at the southwest corner of Washington and Warren. They paid the heirs of James Watson $983.27 for the property, which included nearly 70' frontage on Washington Avenue and 38' on Warren Street behind the Bank as well as the burned-out shell of Watson’s old store building. Construction did not begin immediately, however, perhaps because the Bentons had just completed a building on the north side of the square at that time. There is no record of an architect’s involvement in the project but the contractor was reported to have been Thomas J. Nichols (1854-1905) of Atlanta. Little is known of his career, although he is thought to have built or rebuilt W. A. Kelly’s building at 115 Washington and, in 1903, did build D. B. Benton’s store building on the west side of the square. Nichols died in Atlanta in December 1904 and was buried there at Westview Cemetery. By October, the building was well underway and, on the 28th, the Bentons transferred ownership of the footprint of the new building to Benton Supply Company for $1800. The deed included ½ interest in the well at the rear of the property and suggests that construction of the Funderburg wing of the building was also underway at that time. Figure 5. 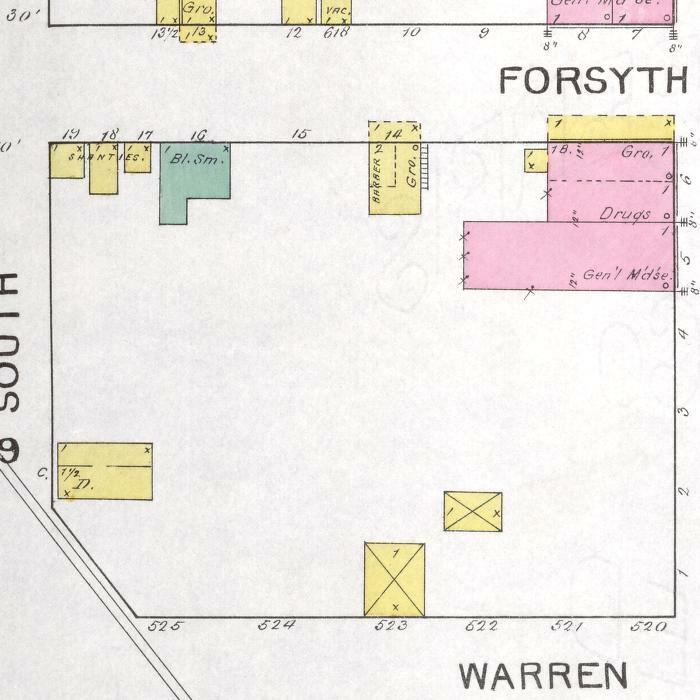 Detail from 1903 Sanborn map showing Block 6 and the new Benton Supply Company building. On December 1, an ad in the local paper announced that Benton Supply Company would be moving “in a few days” and that a moving sale would be continued “until stock is closed out.” In addition to offering “everything in dry goods line . . . at great sacrifice,” Benton Supply had 4,000 pounds of “granulated sugar” offered at one dollar for 25 pounds. “Shoes will be given away absolutely free,” the ad stated. On Monday and Tuesdqy, the 15th and 16th of December, 1902, Benton Supply Company moved into the new building and were open for business again by the end of the week. The newspaper described the new building as “an immense space, fronting two streets, with fourteen rooms on second floor, a roof garden, and is a building that would be a credit to a large city.” The “roof garden” remains otherwise undocumented but the building had electric lights and a telephone, and a water system fed by a 50'-high water tank at the rear of the building. As part of the original construction, the Bentons also created eight offices on the second floor of the building, all accessed by a now-missing stairway to a street-level entry from Washington Avenue. Each of the four offices on the front (north) side of the floor was originally divided into a suite of two rooms, although two of the anterooms were later combined. The one-room offices on the south side of the floor were smaller and #7 was converted into bathrooms, perhaps in the 1930s. The office numbered “8" at the southwest corner of the floor was originally the most spacious of the private offices and may have been the main business office for Benton Supply. However, when the addition was made to the rear of the #3 Washington Avenue part of the building in the 1910s, a hoist was installed in the southwest corner of this office and it became part of Benton Supply’s storage facilities. One of the original tenants of the Benton’s new building was the local telephone company, which moved into the southeast corner of the second floor in February 1903. Acquired by Southern Bell in 1910, the telephone company’s switchboard continued in the building until the system was automated after World War II. The office continued to be used by the telephone company’s billing department until the 1970s. The Benton Supply Company Building also housed a number of professional offices, which were reached via an entrance and stairway from the Washington Street sidewalk. In addition to their own offices, the Benton’s brother-in-law Col. J. H. Kelly maintained an office in the building as did lawyers Benjamin Warren and William H. Keys. Dr. G. W. H. Murrelle was one of a number of dentists who occupied the office at the northwest corner of the second floor of the present building. Although not all of the tenants have been identified, the offices in the Benton Supply Company building appear to have remained occupied until the 1960s when the sidewalk entrance and stairway were removed. The only major addition made to the building occurred between 1909 and 1921 when the Bentons built an extension at the rear of the west side (112 Washington Ave.) of the building. The addition housed the company’s credit counter and two small offices on the first floor and a store room on the second floor. A “hoist” or freight elevator was also installed between floors, including the basement which was connected to the Benton’s agricultural department in the first floor of the Funderburg wing of the building. Few changes to the exterior of the buildings were made after that time, although there were numerous changes to the interiors. Most of these may have occurred in conjunction with a major renovation of the main department store that occurred in the late 1930s. There is evidence of fire damage in the ceiling of the second floor hall but it is not known when the building might have burned. In the 1960s, the original first-floor windows, bulkhead, and second floor staircase were removed from the 112 Washington Avenue portion of the building and replaced by the existing aluminum-framed store windows and door. The newspapers and deeds do not mention construction of the stables at the rear of Benton Supply Company. 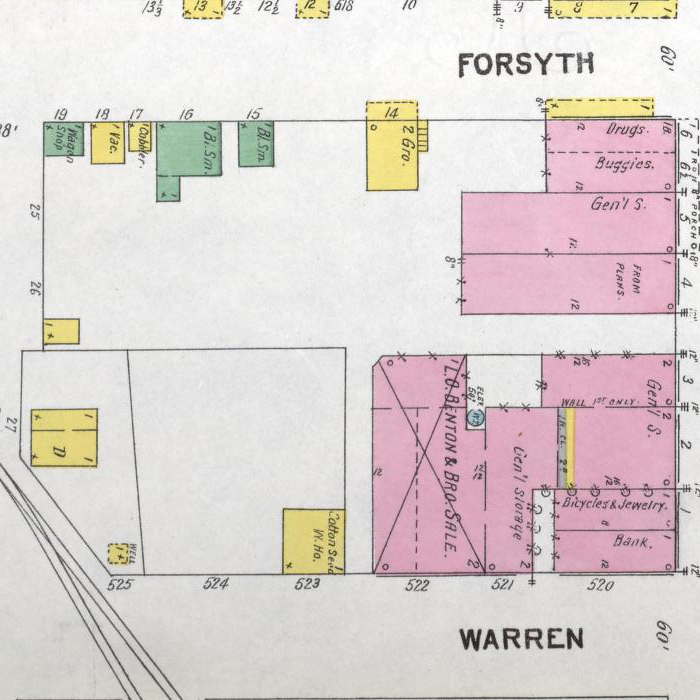 Sanborn Fire Insurance maps show that the two stables that Watson had built there in the early 1890s were replaced by 1903. 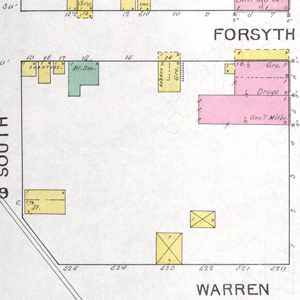 The Bentons’ deed of the building’s footprint in 1902 makes mention of a one-story stable abutting the property on the rear and gave “permission to build 12" thick wall for second story” on the wing of the Benton Supply building that fronts 107 Funderburg Drive. 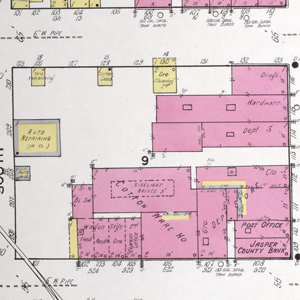 The 1903 Sanborn Map shows the stable as being two-stories high, indicating that the Bentons added a second story about the time they were building the store itself. Sometime between 1909 and 1921, however, they replaced or enlarged this stable and created a new, two-story facade that eliminated the alley between the old stable and the Buggy Manufacturing Company building. This remodeled stable remained in use until around World War II when it became the office and store house for a pants manufacturing company. Only the facade of this building at 106 Funderburg remains standing today but evidence of the earlier buildings is still visible on the exterior of the south wall of the 106 Funderburg building. About the same time that the Bentons rebuilt their stable building, they also constructed a large cotton warehouse that almost completely filled the space between the Benton Supply Company building at the north end of the site and the blacksmith shop and Buggy Manufacturing Company building at the south end. They had been partners in establishment of the Planter’s Warehouse on the south side of Washington just west of the railroad in 1892 and this new warehouse was constructed in response to the dramatic increase in cotton production in the years before World War I. However, the devastation of the cotton economy by the boll weevil after World War I greatly reduced the demand for cotton warehouse space and, by the 1930s, the warehouse behind Benton Supply Company was being used as stables or warehouse space. Its use after that time has not been documented. Only part of the east wall, the perimeter foundation, and part of the floor of this building remain standing. Figure 6. Detail from 1921 Sanborn map showing Block 6 and Benton Supply Company building, denoted here "Dept. Store." In 1908, Jasper County constructed a new court house and, the following year, had the old antebellum building on the square demolished. Dr. R. L. Furse is reported to have purchased salvaged materials for $75 and, almost immediately, re-sold them to L. O. Benton. No inventory of these materials has been located but they are thought to have included brick and stone columns or pilasters from the old court house. Benton then used these materials to construct the two-story brick building that is now standing on at 102-105 Funderburg Avenue just north of the railroad. The building was constructed for the Monticello Buggy Manufacturing Company, which assembled and painted buggies on the second floor. Attached to the southwest corner of the building was another brick building, one-story high, that housed a blacksmith shop. The history of the Monticello Buggy Manufacturing Company is only partially documented, but it existed for only a few years. By 1921, the first floor of the building had been converted into four store fronts while the second floor of the building was being used for “wagon storage.” Occupying the store fronts were a feed store, a grocery, the railroad express office and a “refreshment” business. A variety of other tenants, including restaurants and a woodworking shop, occupied these stores until they were finally abandoned in the 1970s. By the 1960s, the many social and economic changes that marked the post-World-War-II era were beginning to take their toll on the viability of many historic downtowns, including Monticello’s. By the 1970s, the Benton’s department store still struggled on but the remodeling of the grocery store included removal of the stairs from Washington Street to the second floor offices. On Christmas Eve, 1974, the Benton Supply Company closed its doors for the last time and all of the buildings on the site were effectively abandoned. A significant amount of the store’s merchandise remained in the building along with furniture, business records, and many other artifacts. In spite of neglect, the building remains an excellent example of turn-of-the-century commercial architecture and its original 1902 facade remains almost totally intact. It was included in the National Register listing of the “Monticello Historic District” in 1997. 1. Marcia Hayes Carnes, et.al., History of Jasper County (Jasper County Historical Foundation, 1984), 6-7. 2. Harvey Powell notes, courtesy of Mrs. Laree Benton. 4. Jasper County Deed Book F, 37 & 38. 5. Jasper County Deed Book G, 346 & 347. 6. Marcia Hayes Carnes, et.al., History of Jasper County (Jasper County Historical Foundation, 1984), 99. 7. History of Jasper County, p. 8; alley noted as a significant feature in National Register information. 8. Jasper County Deed Book I, 196 & 197. 9.Jasper County News, 3 February 1887. 10. The demarcation between this earlier one-story building and the second floor that was added in 1902 is clearly evident on the west wall of the existing building. In addition, there is evidence of an earlier window opening on the north side of the arched opening that once connected the two parts of the Benton Supply Company’s first floor. Neither the deed nor the contemporary newspaper accounts mention the presence of what must have been the ruins of Watson’s old building. 11. Jasper County Deed Books I, 196; J, 56 & 57. 12. Jasper County News, 2 December 1886. 13. Jasper County Deed Book K, 294. 14. Jasper County News, 3 February 1898; Jasper County Deed Book L, 294 & 295. 15. Jasper County News, 12 August 1897. 16. History of Jasper County, 111. 17. Jasper County Deed Book M, 164. 18. Jasper County Deed Book M, 320; Jasper County News, 10 July 1902. 19.Jasper County News, 28 August 1902 and 21 May 1903. 20. It is possible that Thomas J. Nichols was related to David L. Nichols, the only Nichols to identify himself as a contractor in the Atlanta city directories around the turn of the century.. Born in 1838 in South Carolina and a Confederate veteran, David Nichols moved to Acworth, Georgia, after the Civil War before relocating to Atlanta in 1890 along with his wife and three sons. He lived at Edgewood, a small community on the Georgia Railroad between Atlanta and Decatur but his work has not been documented. David Nichols died in 1911 but his son John M. Nichols continued the Nichols Construction Company’s business at least through 1916, when he advertised in Atlanta’s City Builder. 21. Jasper County News, 7 August 1902 & 28 August 1902. 22. Jasper County Deed Book M, 225. 23. Jasper County News, 4 December 1902. 24. Jasper County News, 1 and 11 December 1902. 25. Jasper County News, 11 & 18 December 1902. 27. History of Jasper County, 17. 28. See Sanborn maps, 1909 and 1921. 29. Stylistic details on the interior suggest a 1930s date for the remodeling of the main store. In addition, the second bathroom that was added to an early (possibly original) bathroom on the east side of the main floor appears to be contemporaneous with the remodeling and has a toilet dated 1937. Ben Orr, the East Point sign painter who painted the lettering and detail on the store front windows, which also appear to be contemporaneous with the remodeling, was active between 1934 and 1941 and for a brief period after World War II. 30. History of Jasper County, p. 12. Issues of the Monticello Daily News from 1909 have apparently been lost so that newspaper research on the demolition of the court house and construction of the Monticello Buggy Manufacturing Company building was not possible. 31. Interview with local historian John Harvey, 7 December 1998. 32. Sanborn Fire Insurance Map, 1909. Carnes, Marcia Hayes, John P. Harvey, Irene Roberts Malone. History of Jasper County. Jasper County Historical Foundation, 1984. Jasper County Superior Court, Records of Deeds and Mortgages. Sanborn Fire Insurance Maps, 1893, 1898, 1903, 1909, 1921, 1931, 1945, microfilm, Georgia State University. Jasper County News, microfilm, University of Georgia, and partial abstract made by Harvey J. Powell. Monticello Daily News, microfilm, University of Georgia; originals in vault of Jasper County Probate Court. Oral Interviews with John Harvey, Blossom Henderson, and Laree Benton.